Here is a new idea for you to add to your Kindergym program if you haven't already! Rhythm and sound is an important part of development and should be included within your program planning. We try and make as much of our equipment as possible so that my parents can copy and make them at home for their children to gain the full benefit of the activities. All you need to do is ask your families to donate any old baby formula tins once they are finished with them. Also ask for the plastic lids. You need more lids than tins, so once you get enough tins just ask for the lids. To begin, wash and dry the tins. Then decorate by covering them with the plastic contact of your choice. Place a lid on both ends. Ta Da! You have created a drum! 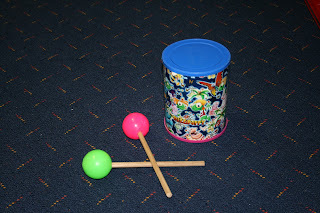 For drum sticks I used dowel cut into short lengths (you may paint these if you wish), then a used small ball pit balls for the ends. I poked a hole in the ball and pushed the stick inside. Ta da! Drum sticks. Play some music and let the children make some noise. The children love them!